GeoHECRAS allows the user to download FEMA National Flood Hazard Layer (NFHL) as shapefile data by using the FEMA Flood Data command. The NFHL is a digital database that contains flood hazard mapping data from FEMA’s National Flood Insurance Program (NFIP). This map data is derived from Flood Insurance Rate Map (FIRM) databases and Letters of Map Revision (LOMRs). The NFHL provides users with the ability to determine the flood zone, base flood elevation and floodway status for a specific geographic location. From the Watershed ribbon menu, click the FEMA Flood Data dropdown combo box listing and then choose the FEMA NFHL Download command. The FEMA NFHL Download dialog box will be displayed. In the General Specifications section, by default the Layer group name is FEMA NFHL Data and can be changed by the user. Click the […] button beside the Shapefile path entry to specify the directory location to save the downloaded GIS shapefiles. Current screen limits: Use the existing extent of the Map View display. User-defined limits: The user can click on the [Pick] button and draw a rectangle on the Map View representing the user-defined limits for the FEMA map data to be downloaded. HEC‑RAS model extents: Use the HEC‑RAS model extents. 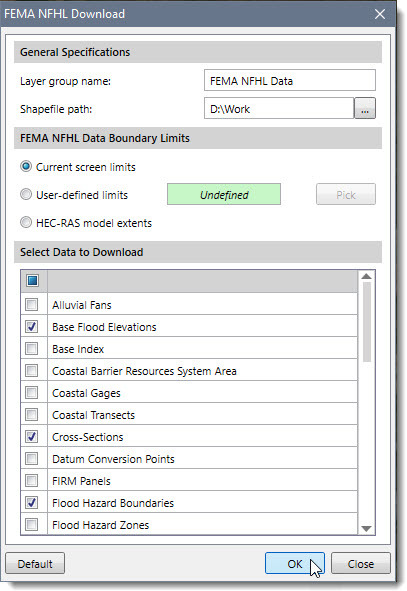 In the Select Data to Download section, the user can choose various FEMA NFHL elements to download. The user can use the provided default selection as these are typical options used. 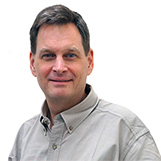 However, the user can experiment with the various options to customize what FEMA map elements should be downloaded. To return to the default settings, click the [Default] button. When the options have been properly defined, click the [OK] button and the software will download the FEMA NFHL data. After the FEMA map data has been downloaded, the software will then load the downloaded FEMA data as a new group in the Map Data Layers panel. Expand the group to see the details of the loaded layers. 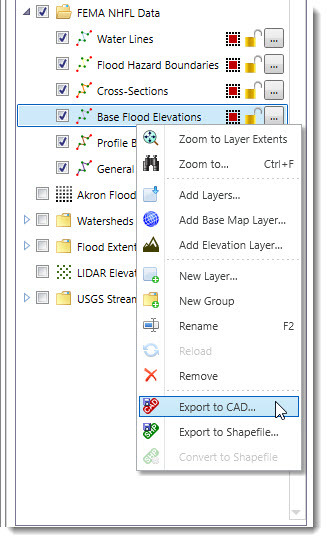 The user can also export the layers to CAD by right-clicking on a layer and then selecting the Export to CAD command from the displayed context menu.